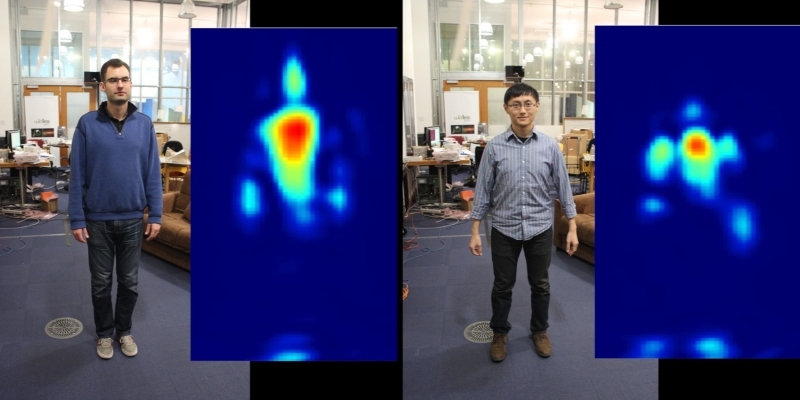 Researchers at MIT's Computer Science and Artificial Intelligence Lab are developing a device that can identify people through walls using Wi-Fi signals. The amazing technology, called RF-Capture, “can trace a person’s hand as he writes in the air and even distinguish between 15 different people through a wall with nearly 90 percent accuracy,” MIT said in an announcement today. The team at MIT has been working on this technology for the last few years; in 2013, they showed off similar radio frequency technology that could detect the presence of human motion from the other side of a wall, Gizmodo reports. But now, after two more years of developing RF-Capture, the technology is sophisticated enough to 'see' the silhouette of a person standing behind a wall. RF-Capture works by transmitting wireless signals through a wall which are then reflected off people's bodies on the other side. Those reflections are captured by the device and, using an algorithm to identify body parts, are stitched together to create a silhouette of the moving figures. Researchers say that they can sometimes even detect things such as heart rates and breathing patterns. This all requires a lot of processing power, as the signals capture background noise which distorts the image. This noise is reduced by first capturing a series of images of the scene. "At a high level, we suppress noise by combining information across time and fitting the data into a model," Fadel Adi, one of the researchers, told Gizmodo. "The algorithms that we developed fit all of these snapshots into a coarse human model with major body parts — such as head, chest, arms, and feet. That is, we combine these snapshots in a manner that maximizes the ability of the reconstructed silhouette in representing the human body." See more of RF-Capture in the video below. More tech with good intentions that will know doubt end up getting abused by some police force or government somewhere... I'm looking at you david cameron... Forget the tin hats its time for lead wallpaper. Uvindu and rondean2000 like this. Grounded tin-foil wall paper would be better since it is not made of a toxic material. Oh great! Now how am I going Fap in peace. Ha ha Thats true, and tinfoil would be easier to put up. Sit in a big tinfoil lined cardboard box. This is awesome, imagine if they could incorporate this technology into eye glasses? It would be like superman's x-ray vision, or more like thermal vision. by using it to watch others? or .. if you have that fetish of like to be watched.. you'll just be happier.